At CeBit 2012 in Hanover, Germany next month, Verbatim is expected to take center stage with the introduction of some new products. Will the new Verbatim hard drive and flash drive products make it big in the market or will they become another standard option in a sea of choices? Of all the products Verbatim offers, the biggest success of the lot would probably the hard drives. Be it portable or desktop, the company has the best assortment of offerings available to the public. Aside from top of the line quality, reliability and performance of the units, Verbatim’s offerings come in sleek and fashionable outfits that are as trendy as they are functional. The newest addition to Verbatim’s hard drive family is the new SATA-III SSD that uses Universal Storage Module (USM) system. The USM is highly flexible, being able to connect to devices via a wide array of interface cables. This makes it possible for the device to be plugged directly into peripherals such as television sets, gaming consoles and more. Users can choose to connect via USB 2.0, USB 3.0, Firewire or Thunderbolt. Also, with this drive you can opt for the SATA interface. Verbatim forecasts that many manufacturers will be adapting the new USM slot feature in their products for media connectivity because it is perfect for techies that prefer all of their devices to be interconnected and synched. 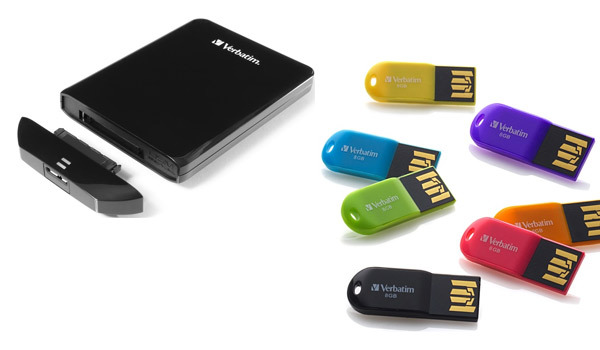 Meanwhile, earlier this year at the CES 2012, Verbatim introduced new USB drives to the market under the company’s Store ‘n’ Go line. The prime feature of these USB drives is their durability in protecting precious files from water, dust, and rough handling. The micro USB drive is covered by a flexible, rubber-like protective layer and has an incorporated key ring to make the device easily attachable to bags, notebooks and key chains. The device would surface as an instant must-have for students, photographers, businessmen, DJs, visual artists – basically anyone that needs readily available data storage right at their fingertips. And since the device is compatible with all USB ports, users with Mac and/or Windows PC can take advantage of it. The Store ‘n’ Go USB drives come in 4GB to 32GB capacities and are available in a variety of bright colors. As with the company’s other similar offerings, the new Store ‘n’ Go drives also have a lifetime warranty. The new micro USB drive is available in the first quarter of the year and valued for $19.99. When it comes to data storage management, Verbatim has cultivated its reputation as one of the most reliable brands out there. Are you looking forward to grabbing some products from Verbatim’s latest collection? Drop a comment below! This entry was posted in Articles, USB 3.0, USB Devices, USB Gadgets, USB Storage Drives, Verbatim, Verbatim Store n Go and tagged CeBit 2012, Micro-USB drives, Store n Go USB drives, Universal Storage Module, USB Storage Options, USM, USM slot, Verbatim flash drive, Verbatim hard drive, Verbatim SATA-III SSD, Verbatim Storage Devices, Verbatim Store n Go, Verbatim USB storage. Bookmark the permalink.